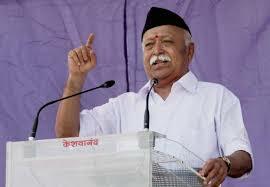 RSS chief Mohan Bhagwat said once again on his tune to build Ram Temple. Addressing a public meeting in Kolkata on Wednesday he said, "if a grand temple has to be built, we must have to boost our sacrifice." However he did not confirmed any statement of time frame to build temple. While laughing life which is passing is before you. We have to sacrifice our lives. When we will do so, the temple will be erected. We will preach the whole world from the land of India. It is noticeable that Mohan Bhagwat had raised the issue of Ram Temple erection at Ayodhya during the tribute ceremony of Late-Ashok Singhal, VHP leader, before it. He had appealed to meet to the dream of leader of Hinduism by the ‘serious effort’. Paying tribute to singhal in November he had said that singhal wanted to meet with two things. The first was to erect Ram Temple at Ram Janam Bhumi; and second, to preach of Vedas. He said all these can be met only by doing earnestly the work in the direction of targets. We will have to do serious effort to meet the erection of Ram Temple and this will be his true tribute. The feelings of Ashok ji will pave our way in this work. We have to go ahead the way which Ashok ji had indicated; to work; and to expect that we will do the work to meet the erection of Ram Temple dream.